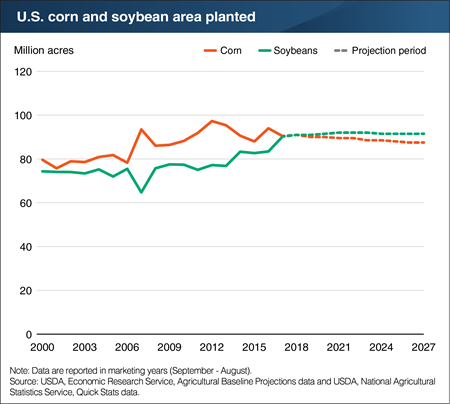 For the first time, the area of soybeans planted in the United States is expected to exceed the area planted for corn in USDA’s newly released Agricultural Projections to 2027. The two crops are the most widely produced in the United States, accounting for more than half of all acres planted. There are many reasons for the growth in soybean area relative to corn. Corn production has benefited from sustained growth in yield per acre, allowing farmers to dedicate less land to corn while maintaining the same output. While soybean yields also improved, the relative gains are not as large. As corn yields grow, overall area planted to corn is projected to trend lower. Additionally, soybean demand is heavily tied to domestic and international demand for meat. Soybean meal is a primary component of animal feeds across species. Rising incomes in many emerging economies have translated to increased meat consumption and international demand for soybeans. This rising demand is expected to place upward pressure on soybean prices and increase producer return, incentivizing further plantings. This chart is drawn from data in the USDA report, USDA Agricultural Projections to 2027, released in February 2018.